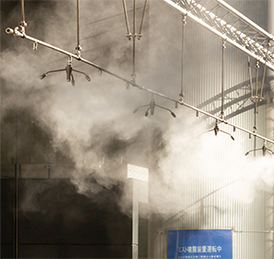 Misting systems work by forcing water via a high-pressure pump and tubing through a brass and stainless steel mist nozzle that has a small orifice, producing a micro-fine mist. The water droplets are so small that they instantly evaporate. Misting systems are used in tropical and warm weather environments to cool public spaces, sporting events, and other applications.